The dreadful state of copyright law in the digital age can be nicely illustrated by a thought experiment. * If one thinks back to 1980, it is hard to imagine how one could have committed a copyright violation with a book, an LP or a reel of film. Lending the book to a friend, duplicating parts – or even the whole book – on a photocopier, or staging a reading were all possible without clarifying rights. While copyright was already a complex matter at that time, until the internet it played little role in most people’s everyday lives. Today everything is different. Anyone who uses a smartphone to video everyday experiences and share them with friends in a personal blog will hardly be able to avoid violating copyright. A couple of seconds of music or a poster in the background will suffice if “making publicly available” in the internet violates copyright. Many of the most creative digital artforms, such as remix and mashup, are almost impossible to disseminate by legal means, still less to commercialise. The use of even the briefest music or video sequence must be legally clarified, and in most cases this is much too complicated and expensive. Libraries, museums and archives battle with similar problems, preventing them from digitising their holdings. Introducing a Right to Remix? Apart from shorter copyright periods, there would be two other sensible approaches to solving this problem. Firstly, a European harmonisation and expansion of the catalogue of copyright limitations and exceptions would be sensible. The introduction of a de minimis or remix exemption modelled on the fair use clause in US copyright, combined with the forms of flat-fee reimbursement established in Europe, would enable new forms of recreational and remix creativity. Even for commercial publication of remixes and mashups all that would be required is to notify the relevant copyright collecting society (as is already the case for cover versions), in place of the complicated and expensive process of clarifying rights. Secondly, the establishment of a European register of works would simplify clarification of rights and restrict ongoing copyright protection (after an initial period) to cases where works are in fact still in commercial circulation. While the recent Google Books ruling by the US Second Circuit has once again proven how the US copyright system is – thanks to its fair use provision – more flexible and adaptable to digital challenges than its European counterpart, in other fields the legal situation is very similar on both sides of the Atlantic. 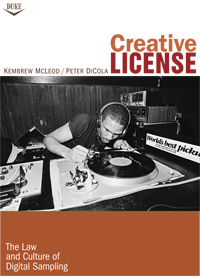 One such field is digital sampling in music, which is the topic of the book “Creative License: The Law and Culture of Digital Sampling” by McLeod and DiCola (2011, Duke University Press). Sampling is a comparably recent practice where parts of sound recordings are reused in creating new works. According to McLeod and DiCola, “a good appropriated sample has […] a good quality of its own, and it has a strong reference that evokes cultural resonance as well” (p. 99, emphasis added). The latter of the two, cultural resonance, not only adds an additional meta-layer of cultural reference to a song but is also the main reason for legal calamities associated with sampling. As with remix practices more generally, a core characteristic of sampling is that the old remains visible within the new and is not hidden behind a (more or less transparent) veil of originality. In Germany, the decision “Metall auf Metall” by Germany’s highest court had identical consequences. The detrimental effects of such a restrictive application of current copyright to the artistic practice of sampling are the reason why sampling-based creativity suffers from permission culture. In the end, nothing happened. When the European parliament adopted a compromise version of MEP Julia Reda’s evaluation report of the EU copyright directive, the attempt of MEP Jean-Marie Cavada to restrict the right to publish pictures of buildings and artworks permanently installed in public places (“freedom of panorama”) was voted down by a huge margin. The majority that had supported the Cavada amendment in the legal affairs committee vanished under a storm of protest, spearheaded by Wikipedians fighting for their right to include pictures of buildings and artworks in their free encyclopedia. However, while the final version of the report did not suggest restricting freedom of panorama, it did not include a specific provision to protect it, either. Instead, member countries would still be free in whether and how to implement such a limitation into their respective national copyright laws. In a way, this outcome is a typical example of the widespread copyright extremism in Europe, which blocks even the most sensible and moderate copyright reform proposals. The overall spectrum of opinions in current copyright debates ranges from abolitionism, that is, proposals to discard copyright altogether, to copyright extremism on the other side. 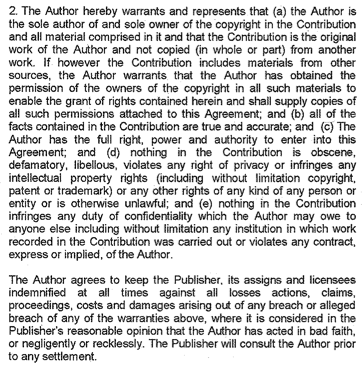 Copyright abolitionism is a position sparsely mentioned in regulatory conversations. While authors Joost Smiers and Marieke van Schindel, for instance, have managed to create some buzz around their book “No Copyright”, the attention was only short-lived and the discussion left no real lasting mark on the conversation overall. And abolitionist positions brought forward by libertarian researchers such as Michele Boldrin, David K. Levine and their colleagues have only played a very marginal role in scientific discourse, as well. 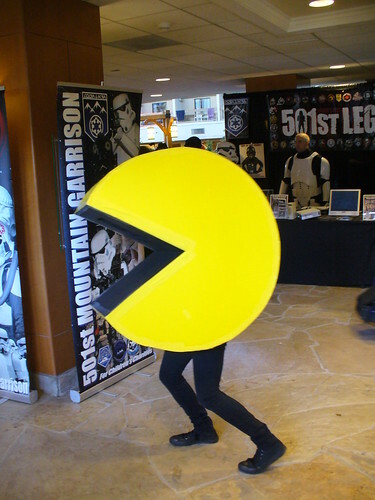 However, we observe that rhetoric around ratcheting up extreme copyright protections plays a major role in the mainstream of regulatory conversations around copyright, while rarely recognized and called out as extremism. Rather, even the most far reaching positions are considered perfectly legitimate when brought forward in committee hearings, policy papers or campaigns. In a way, current copyright discourse is heavily skewed towards the side of copyright extremism, which makes any moderate and balanced reform of copyright laws difficult, if not impossible. Taking a closer look at the relentless rhetoric of copyright extremism might therefore help to identify and address this problem. Earlier this year, Google revealed that it routinely removes search results that link to material allegedly infringing copyrights, thereby following removal requests of copyright holders (see “New Layer of Copyright Enforcement: Search“). 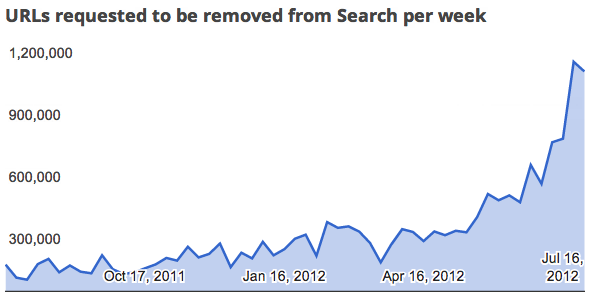 Since this announcement, the number of removed search results per month has quadrupeld (see Figure below). As in discussed in the first entry of this series on algorithm regulation, the technological layer of regulation is becoming increasingly important for copyright enforcement. But Google’s move to tinker with its most precious asset, the search algorithm, also evidences that technological regulation of this kind may directly result from stakeholder negotiations. Recently Google announced an extension to its “Transparency Report“, which now also includes a section on requests to remove search results that link to material that allegedly infringes copyrights. Last month, Google processed 1,294,762 copyright removal requests by 1,109 reporting organizations, representing 1,325 copyright owners. 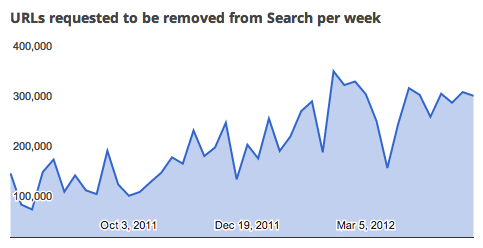 The Figure below illustrates how the number of requests has increased between July 2011 to mid May 2012. While the dust of the SOPA and PIPA battle in the US has not settled yet, we quickly approach the next showdown around an acronym in the realm of intellectual property regulation. This time the main battleground is Europe, the acronym is ACTA. The “Anti-Counterfeiting Trade Agreement” had been negotiated secretly for years until in early 2010 a draft of the agreement was leaked (see Michael Geist; for a critical and more up to date overview see the ACTA info portal of La Quadrature du Net (LQDN)). Since this leak, the draft had been substantially reworked and, last week, the treaty was signed by representatives of the European Commission and 22 member states in an official signing ceremony. However, the political controversy is far from being over. For one, the treaty needs to be approved by the European Parliament, which is now the main target for mobilization of both supporters and opponents. For another, the signing of ACTA has sparked surprisingly strong protests in some EU member states, above all in Poland (see video below). The intensity of the Polish opposition has in turn raised attention in neighboring states, most importantly in Germany, as well.